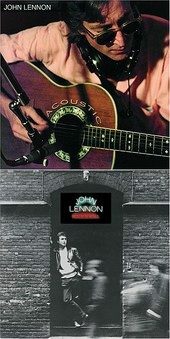 A new Lennon release and a re-issue of an old Lennon title showcase the different sides of the legendary songwriter. The first is Acoustic, a record compiled by Ono, comprised of 16 skeletal tracks - since Lennon never got around to doing a proper acoustic record (despite his love of playing out solo acoustic). And the second is Rock 'n' Roll, recorded and released in 1975 (re-released here with bonus tracks and re-mastered), featuring a collection of Lennon's favorite boyhood rock 'n' roll songs. Acoustic includes three live songs recorded in the early 70s - "Luck of the Irish", "John Sinclair", and an equally compelling version of "Imagine" (the guitar giving the song a sharp contrast compared to the piano version). It also includes newly unearthed demos from the Plastic Ono Band sessions ("Well Well Well", "God", and "My Mummy's Dead"). And a new version of "Cold Turkey" that fans of Lennon will gravitate towards. Lennon's voice and lyrics meld together with his mellow acoustic guitar, giving the songs new prospects that open them up to the listener even more than their studio counterparts - or at least in a different light. Though they're demos and were never meant for release, the performances are ripe and lively, comprised of compassion and honesty, and showcasing why Lennon's voice was a voice of unprecedented beauty. However, the most intriguing aspect of Acoustic, besides the music, is the lyrics and tablature found inside, a must have for the guitar-enthusiast who wants to learn all the Lennon songs on the disc. Then we have Rock 'n' Roll, re-mastered and re-released with four bonus tracks ("Angel Baby", "To Know Her Is to Love Her", "Since My Baby Left Me", and "Just Because (Reprise)". Which gives us further exploration into the original concept behind Rock 'n' Roll a look into what music inspired the Ex-Beatle, who went on to become one of the most influential songwriters in history. Also including everything from Chuck Berry's "Sweet Little Sixteen" to Buddy Holly's "Peggy Sue" and Gene Vincent's "Be-Bop-A-Lula", here is a seventeen track look into the 50s rock that helped change the face of music, and paved way for The Beatles invasion. Originally enlisting the help of Phil Spector to produce the project, those sessions quickly came to a head and fell apart (producing only four songs), and leaving Lennon to pick up the pieces himself. A more than worthy producer, and a vocalist and musician easily capable of pulling off the songs, most versions match the quality and integrity of the originally, with only a few, such as "Sweet Little Sixteen", pale in comparison to the originals. Still, it's a look into Lennon that his own songs were unable to provide us and thus something worthy. Both Acoustic and Rock 'n' Roll rank high for their different reasons, with Lennon proving (as if he needed to), that he was quite the versatile songwriter and musician. I'll give them each an A-.